There is a considerable, and still growing body of scientific literature that suggests that geologists are in fact the world’s first alcohol-based life form. Hence the theme of this month’s Accretionary Wedge #54- One The Rocks: Geo-brews and Geo-cocktails. This idea came about as Michael Klass, Julian Lozos and I sat at a cocktail place in Portland discussing geology, beer and cocktails. Naturally, rock themed booze ideas came out of it and this AW was born. Our submissions for this month were few, but mighty. Elli Goeke at Life In Plane Light shakes up a couple of great drinks in the form of a lava-rock filtered vodka from Iceland and a cocktail based on the Boston Molasses Flood. My fellow PNW blogger, Michael Klaas at the Cascadia Blog, decided on two submissions for this month’s theme: The Magma Chamber for those who like a little heat in their libations and a boozy coffee concoction worthy of any nightcap, or ahem… any start to one’s day. David Bressan at the History of Geology talks about the chemistry of the most important aspect of our preferred beverages: water. Our one lone bottle of the mythical Meteor beer. And my submission for this booze soaked Wedge? Meteor Beer! This one comes to us from the Alsace region of North-East France. According to the website it’s one of the oldest breweries in the country and was founded in 1640. I went with this beer, not just because it’s named Meteor, but because the meteorite Orgueil was found in France. This meteorite is important because it belongs to class of meteorites whose chemical composition closely approximates that of the sun. We use it as a standard when looking at how the solar system evolved chemically over time. Meteor beer and Orgueil have something in common: they’re both precursors to that which would come afterwards in their respective realms. I have a confession though: I haven’t tried this beer. Trying to hunt it down has been nearly impossible- even in the great beer capitol that is Portland, OR. 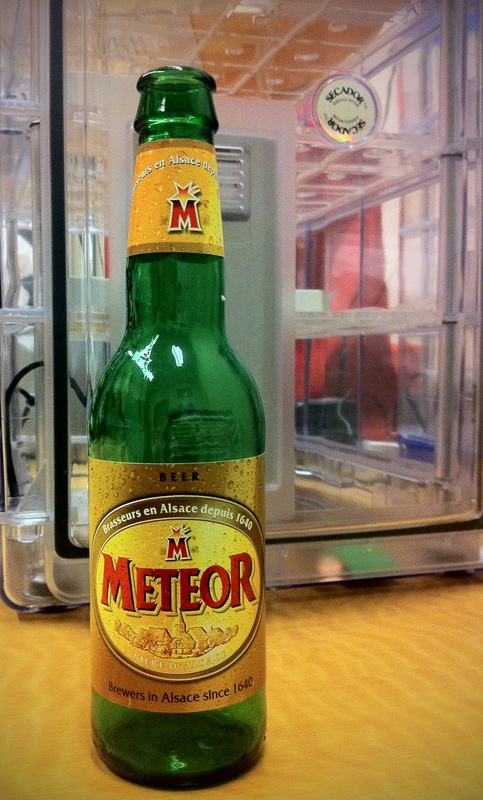 We have an empty bottle of it down in the meteorite lab though and it’s my goal to try one at some point in my life. If after reading these entries you feel inspired to write about your own geology themed drink, or you wrote one and I missed it, post it in the comments section below and I’ll add it to this Wedge. A paleontology themed beer from Silver Fox over at Looking for Detachment. Ann muses on her favorite beer, Rolling Rock. Ian at Hypocentre gives us a look at how geology effects the chemistry of the water in the brewing powerhouses that are the British Isles and Czech Republic. Ontherocks at the Geosciblog presents an impressive collection of geo themed beer cans.